Busch Gardens Williamsburg was not a park on my itinerary for this trip; rather, it was somewhere George was planning to visit on his own on the Saturday while I spent the day in the custody of Delta Airlines. Unfortunately, due to a combination of exceptionally bad weather and incompetence from the good folks at Delta that entire plan got shelved at short notice, and George got to spend the night in an airport. As this was a park on his hit list for years we decided to squeeze it into a few hours. There is scope for an entire page about the shortcomings of the second largest airline in the world, whose customer services make a certain low cost Irish airline seem on the far side of superb. However, as this is a coaster site suffice it to say that it is very obvious to us why Delta is in bankruptcy protection. In all honesty, given our experiences, neither of us will be going out of our way to fly Delta again in future. The only significant change since my last visit to the park has been the removal of the old Wild Maus in favour of a major new dark ride, a positive alteration even from the perspective of a coaster counting enthusiast. However, this has brought with it a negative change too, insofar as the admission fee has been increased to the point that the park is now one of the most expensive in the world for a single day admission. 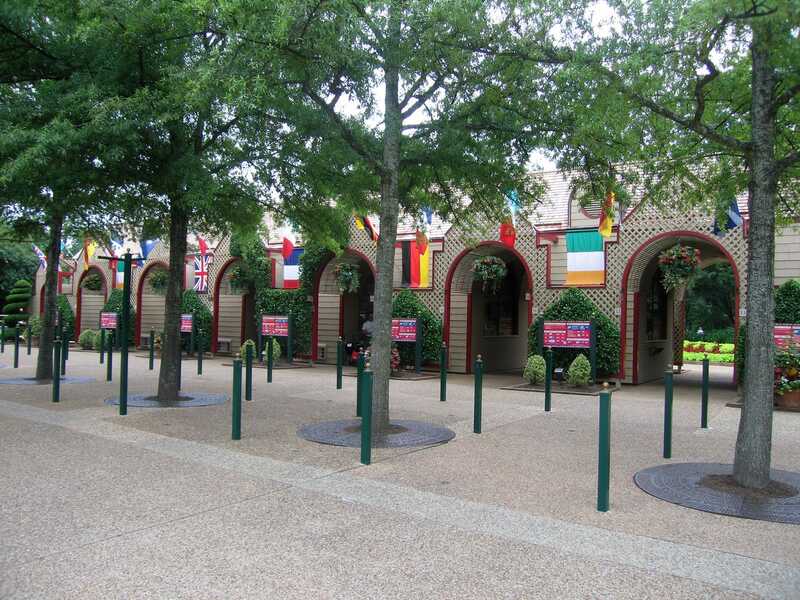 There is no doubt that visitors get a lot for their money, with a wide variety of high quality attractions and shows as well as some spectacular landscaping. However, this doesn't take away from the fact that a full day admission without parking now costs more than fifty dollars per person. One can legitimately argue that this is not a problem as long as guests are coming through the gate, and given the waits we saw the park clearly doesn't have any issues there. Nevertheless, it puts the park out of reach of a lot of people, which is really a sad state of affairs. The first thing we did on arrival was inadvertently upset a staff member. There was nobody in the cattle pen leading towards the entrance gates, so we stepped over them. This resulted in us being officially grumbled at by a staff member who insisted that we return to the qwaiting point; "I need you to wait here please". A few moments later we were directed to one of the shorter lines, no different to the one we had located ourselves in in the first place. I'd love to know what possible reason the park operations staff would have for this one. While on the subject of silliness, the park suffers from a problem that has annoyed me before in other parks; certain areas do not open until half an hour after the rest of the park. This is no doubt a cost saving measure, but an excessive and wholly unnecessary one when you consider how much money the park must take in. Better yet, when the section finally opened, Big Bad Wolf still hadn't completed its test runs. What better time to make these then when guests have arrived in the station and are waiting to board? The key draw for me, having already ridden the coasters, was the recently added dark ride, Curse of DarKastle. The atmosphere is set even as riders enter the queue line, which, though outdoors, is air conditioned to a temperature sufficiently low to cause those waiting to feel the occasional involuntary shiver. The standard of theming even here is impressive, with the air conditioners totally hidden behind alcoves. Guests will not see where the chill is coming from unless they make an active effort to find it. The ride operates using the same basic vehicles as the Spider-Man attraction at Universal Studios Islands of Adventure, which I have raved about in these pages before. 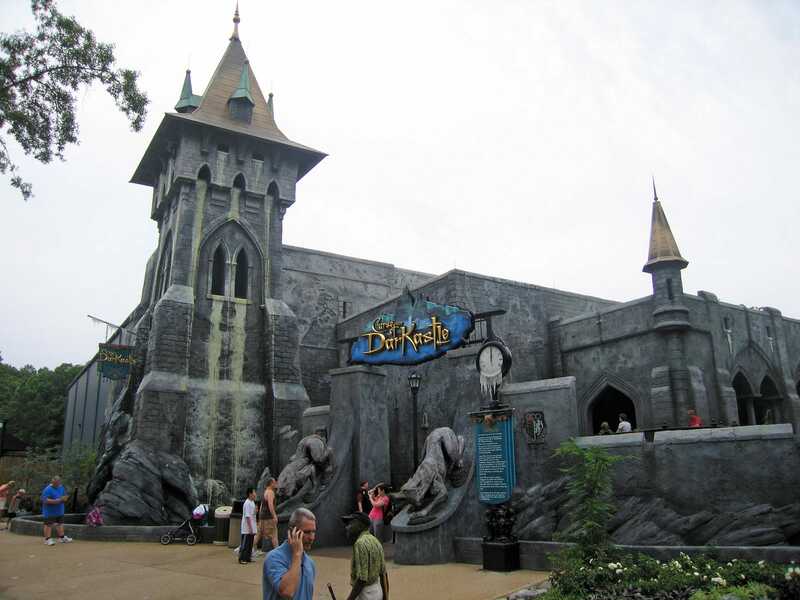 The Busch implementation is targeted at a somewhat older audience, and uses the 3D features in a particularly dramatic fashion to startle riders. The effects are so good, in fact, that the queue features a warning advising parents that some scenes may be too intense for younger children, and as it happened we did see a crying child on the exit ramp as we disembarked. On the whole the park has a winner with this ride, although it could use just a little bit more tuning in a few places. On one occasion the car made a 180° turn, but not quite fast enough to prevent those on board seeing the previous scene resetting itself. At another point riders can (briefly) see the track system the ride is running on. These are of course nit picks only, but they would seem to be relatively easy fixes that could bring the attraction from a top twenty ride to a top ten one. Apparently the park has already done some tweaking on the ride since its first season; a little bit more should make it perfect. We naturally found time for the four remaining coasters. Big Bad Wolf has improved somewhat with age, probably due to less aggressive braking than I remembered. The other three coasters hadn't changed at all, which is a good thing; it's nice to see park maintenance looking after them properly. My overall impression of the park was stated above but bears repeating. The quality of the product is superb, but there just isn't enough of it given the admission cost. A major new coaster is under construction for next year, and to be honest one is sorely needed; as it was we'd done all the majors bar the shoot-the-chutes attraction in less than two hours, including multiple rides on Alpengeist. With the necessity of a second park today we elected to forego any of the shows, making our exit just after lunch time. Trying to hit a major park like Kings Dominion in half a day is not altogether smart. As mentioned above, however, this was the net result of trying to rearrange a day at short notice, rather than something we had planned in advance. As it was, we were very fortunate in that the park was not busy, allowing a whirlwind tour of all bar two of the coasters in the park in just four hours, an impressive achievement for a day in the middle of the summer. We missed out on Taxi Jam as we didn't have a child with us, and we made two unsuccessful attempts to ride Anaconda; on the first occasion, the ride went down with a requirement for a sanitation engineer. It strikes me that the staff could have continued to operate the second train on the ride even while the first was out of commission due to an infusion of, as it were, carrots and peas. However, they chose not to do so; perhaps there is something in the rule book about this one. On the second occasion, the ride e-stopped stranding one train of riders on the mid course block brake. It obviously wasn't to be. The one question that came up multiple times today was a rather harsh one; why hasn't the park fired all those responsible for looking after their wood coasters? With the sole exception of Scooby Doo the wooden coasters in the park were rough, brutal, violent, painful, jarring, uncomfortable, awkward, and, to summarise, generally not good. I was sorely tempted to skip over Grizzly given what the others had been like, and regretted my decision to give it a courtesy ride within seconds of the train leaving the lift hill. 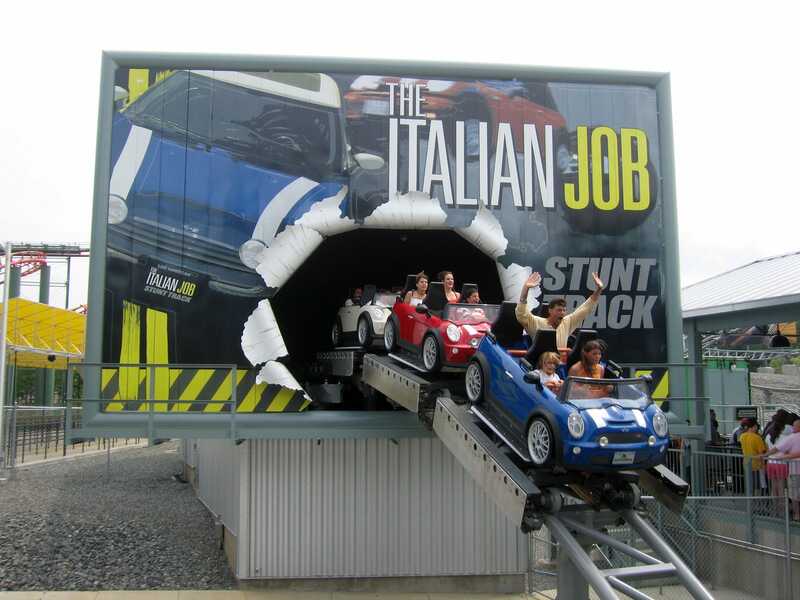 The only new credit for me today was Italian Job Turbo Coaster (#778), a copy of the two Italian Job Stunt Coaster rides installed at sister parks last year. Aside from the change of name the ride was identical, which I'm glad to say is a good thing; Premier have done great things with this design which is fast enough to please coaster enthusiasts while still being slow enough for the whole family to enjoy. Only one question arises, and that is of theming; with the sale of the five Paramount Parks to Cedar Fair this year will these rides retain their theming or will they be rebranded in the future? Only time will tell. On my last visit to the park I proclaimed Hypersonic XLC to be my favourite coaster. It was interesting to come back, six hundred or so coasters later, to see how it has held up in my rankings. There is no doubt that the launch, as with Dodonpa, is superb. The tower is a lot of fun too, with a generous pop of airtime. Unfortunately, like its Japanese brother, it is let down badly by the speed curves afterwards, which the train takes very awkwardly. It is still a lot of fun, but, to be blunt, bumps at eighty miles an hour hurt. If the ride just had launch, tower, and brakes it'd probably still rank in my top five. As it is, it has slid out of the top ten altogether due to its inability to take corners properly. I cannot remember if it was like this when I originally rode it, but I suspect not; I can't imagine I would have rated it so highly back then if so, fantastic launch notwithstanding. The only other attraction tried on this visit was Drop Zone, which had been a little too much for me on my last visit. It is always nice to have a second chance at something you've wimped out of (and later regretted). My ride was supplemented by two specimens of local wildlife, one of whom began to scream continuously when the ride was about fifty feet off the ground. With my usual schadenfreude, I calmly remarked that it was okay; there was only another two hundred and fifty feet to go. The resultant throbbing in my eardrum, which persisted for the better part of the evening, was just payback for my comments, though it was without question well worth it!